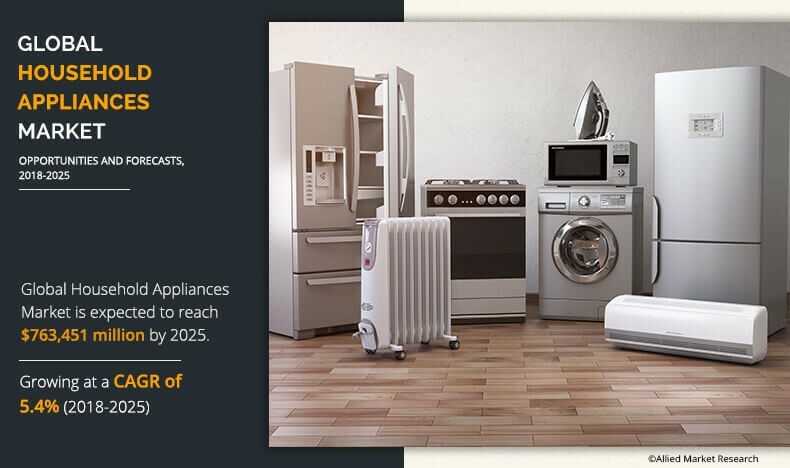 The global household appliances market was valued at $501,532 million in 2017 and is projected to reach $763,451 million by 2025, growing at a CAGR of 5.4% from 2018 to 2025. Household appliances can be classified into three categoriesmajor appliances or white goods, small appliances, and consumer electronics. Major appliances are large home appliances used for regular housekeeping tasks such as cooking, washing laundry, food preservation, and others. They are generally equipped with special connections such as electrical, gas, plumbing, and ventilation arrangements, which limits the mobility of these appliances around the house. Small appliances are semi-portable or portable machines that are generally used on platforms such as counter-tops and table tops. Some of these appliances are air purifiers, humidifiers & de-humidifiers, blenders, clothes steamers & iron, electric kettle & coffee machines, and others. Consumer electronics include devices used for entertainment, communications, and home-office activities such as TVs, music system, and others. The key factors driving the global household appliances market are increase in technological advancements, rapid urbanization, growth in the housing sector, rise in per capita income, improved living standards, surge in need for comfort in household chores, change in consumer lifestyle as well as escalating number of smaller households. In addition, inclination of consumers toward eco-friendly & energy-efficient appliances further boost the market growth. Moreover, factors, such as government initiatives for energy-efficient appliances across the U.S. and several EU countries, are expected to facilitate the adoption of energy efficient appliances in the recent years. 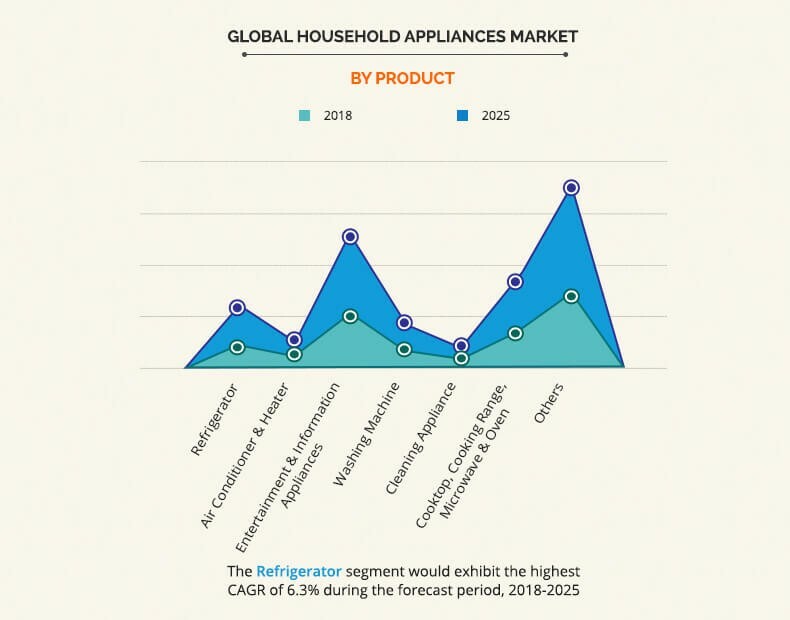 Based on product, the report segments the global household appliances market into refrigerator; air conditioner & heater; entertainment & information appliances; washing machine; cleaning appliance; cooktop, cooking range, microwave & oven; and others. Refrigerator has become an essential part of a household and is one of the first appliances that is purchased once the household income reaches an adequate level. Refrigerators are generally operated continuously throughout the year, and therefore, annual energy consumption is an important issue associated with the product. Energy star rated refrigerators are in high demand as they are installed with efficient compressors, insulation, and defrosting features that help improve their energy efficiency. Thus, manufacturers invest in R&D to innovate energy-efficient products owing to rise in demand for such appliances. 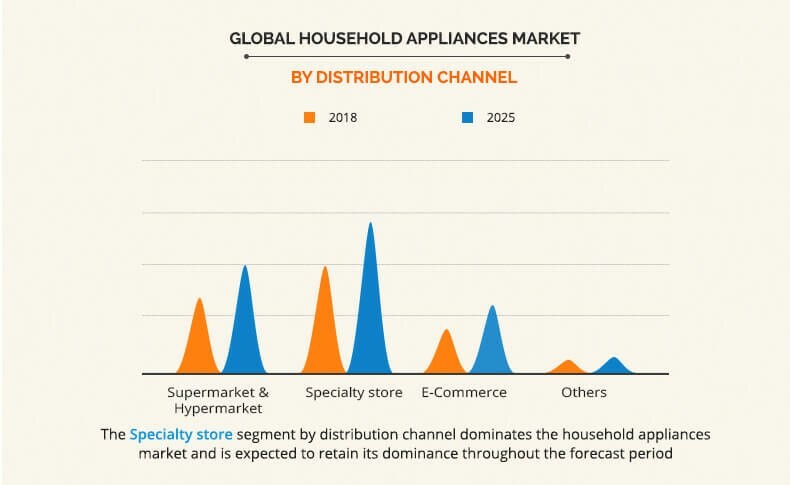 Based on distribution channel, the report segments the global household appliances market into supermarket/hypermarket, specialty stores, E-Commerce, and others. The E-Commerce segment is expected to witness rapid growth during the forecast period owing to high penetration of internet and smartphone, along with technological advancements. However, the specialty store segment dominates the market as consumer prefers to analyze and evaluate the product before purchase, since the product is associated with high stack (especially financial, & safety). Based on region, the household appliance market is analyzed across North America, Europe, Asia-Pacific, and LAMEA. North America is a matured and homogenous market for household appliances with high product penetration. The demand for household appliances is dominated by product replacement. The European market experiences growth owing to low interest rates and a good economic situation. 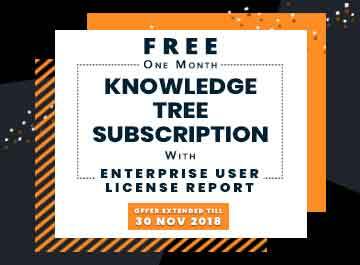 The market is witnessing an increase in demand for premium built-in or integrated appliances such as ovens, with integrated steam function, flexible induction hobs, integrated hob extractors, and built-in dishwasher among others. The Asia-Pacific household appliances market is anticipated to witness strong growth owing to increase in household income, rapid urbanization, rise in the middle-class population, easy access to goods through development of retail channels, easy access to consumer finance, and change in lifestyles of the population. Key players profiled in the report include AB Electrolux, Qingdao Haier Co., Ltd. (Haier), Hitachi, Ltd., LG Electronics Inc. (LG), Midea Group Co., Ltd. (Midea), Panasonic Corporation (Panasonic), Robert Bosch GmbH, Samsung Electronics Co., Ltd., Sharp Corporation (Sharp), and Whirlpool Corporation. Technological advancements have led to the development of smart appliances and are expected to drive the growth of the household appliance market during the forecast period. Appliances, such as washing machine, dishwasher, and refrigerators, are experiencing rapid growth. In January 2018, Bosch launched its double-door refrigerators range Series 4in the market that marked its entry in the double-door refrigerator segment. In July 2018, Xiaomi launched a new product to its Mijia product line. Mijia Smart Air Conditioner, which won the 2017 Good Design gold award, features an anti-UV ABS polymer resin body. The product further includes additional features such as a LED display on the front of the unit, and users can control the temperature and cooling times via the Mi Home app from their smart devices. In October 2018, LG announced the launch of InstaView door-in-door refrigerators, which is expected to feature a glass panel that illuminates the interior with two soft knocks on the glass panel. Frequent opening of the refrigerator door consumes more electricity. Making the door transparent increases the energy efficiency of the household. 7.2. QINGDAO HAIER CO., LTD.
7.5. MIDEA GROUP CO., LTD.
7.8. SAMSUNG ELECTRONICS CO., LTD. 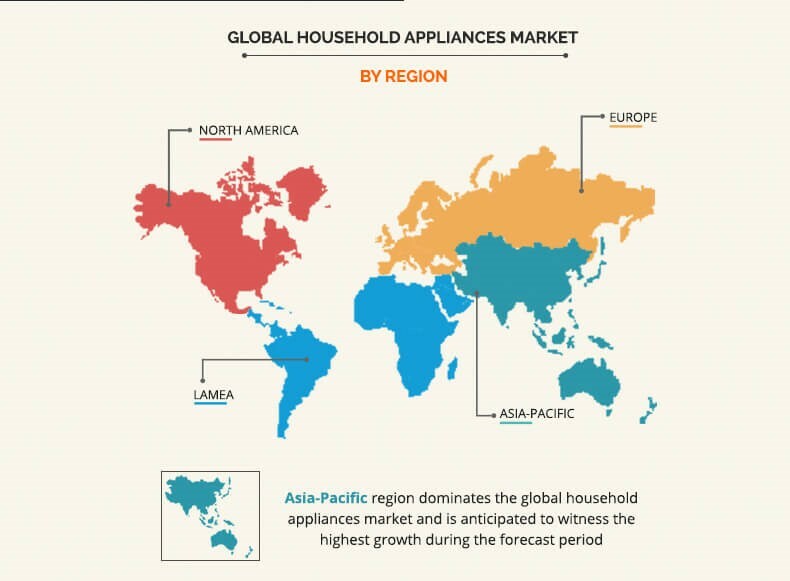 The global household appliances market is emerging at a considerable pace due to several factors such as increase in compatibility of the appliances, enhanced internet penetration, changes in lifestyle patterns, and growth in concerns about energy prices. Over the past few years, there has been an increase in the women workforce; and therefore, families rely on different appliances for comfort. These appliances also help ease the chores and save time. Moreover, Asia-Pacific and LAMEA are projected to register a significant growth as compared to the saturated markets of Europe and North America due to rapid urbanization, increase in penetration of technology even in small cities, growth in disposable income, and improvement in standard of living. In line with increase in environmental concerns, consumers also prefer to buy appliances that are eco-friendly and energy efficient. Therefore, manufacturers take steps to improve the product efficiency and reduce e-waste.